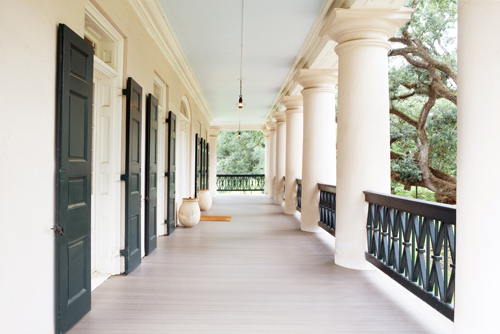 When the Historic Oak Alley Plantation in New Orleans, Louisiana needed to replace the grand sweeping porches that prominently grace the sprawling second story, they chose Aeratis. The reason was simple. They needed a product that had the authentic traditional look of wood planks, but also one that would withstand the harsh Louisiana weather and the hundreds of thousands of guests who annually walk it’s verandas. Aeratis was the only product that would meet all of those needs. Having been proven to out-perform wood, polypropylene, polyethylene and open-cell PVC products, Aeratis is the only porch flooring with the traditional 7/8 x 3 1/8 inch profile, a Class “A” fire-rating, and is ADA slip compliant. It looks so much like wood, that guest to the Plantation home never know the difference. Read the original document from the State of Louisiana approving Aeratis to be installed on the historic Oak Alley.